In a small sauce pan, bring the balsamic vinegar to a boil and immediately reduce the heat to low. Stir occasionally until the liquid in the pan is reduced by half ( you should end up with 1/4 cup). Let cool and pour into a small pitcher or bowl. Start a small fire in your grill using almost 1 chimney of charcoal briquets (30-40). For a gas grill, set the temperature to 450°F. Slice the peaches in half horizontally and gently twist apart. Remove the pit and brush each side with olive oil. When the coals have died down to grey ash (no flames), put the peaches directly over the heat and cook for 5 minutes or until the peaches are soft to the touch when gently squeezed. 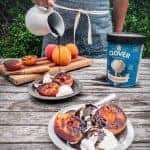 Scoop the vanilla ice cream (we like Clover Sonoma vanilla ice cream, it has just the right amount of butterfat to make a silky smooth sundae) on to dessert plates or bowls and put one or two peach halves on top. Drizzle the balsamic sauce over the top and add a few grinds of black pepper (optional).